Hi, welcome to the website, we hope to have everything for your car and motorbike restoration. If we haven't got it we will look for it for you or have it made for you. TO PLACE AN ORDER Tel- 01636 636735. We do not have a minimum order quantity, you can order 1 or 100, but we do have a postage and packing charge of £3.50 per order up to 1/2 kg weight. If you have any problems getting through by email, please telephone me. We are based in Newark, Nottinghamshire and were one of the first to offer polished stainless nuts, bolts, washers, self tappers etc. We dont buy them in we polish them ourselves so anything we sell can be polished. Small machine screws ,self tappers,usually cost 10p extra on the prices shown, larger screws and hexagon heads cost from 20p to 30p extra. We started in the 1980s attending car and motorbike shows and autojumbles, and have been buying up old stock since then. 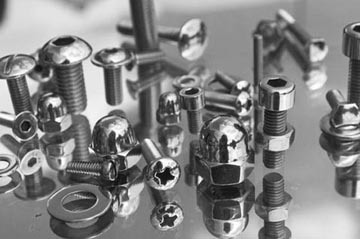 We have stocks of high tensile zinc plated nuts and bolts, as well as stainless steel fastenings. Whether your vehicle is vintage, veteran or classic we can help. We also stock most other fastening in stainless steel - washers, nuts, screws, self-tappers, split pins, R clips, hose clips, fuel line clips, socket grub screws, wing nuts, bumper(coach) bolts socket cap heads, socket button heads, socket countersunk, pozi and slotted heads in countersunk, raised countersunk and roundhead, fillister heads also cheese heads. All can be polished if required. All the old threads for cars and motorbikes - BSF, BSW (Whitworth), BSC (CYCLE), UNF, UNC are on stock. For the modern restorer we have a large and varied stock of Metric in stainless steel. These come in a variety of different heads and lengths. M7 (7mm) is available in stainless steel hexagon head bolts, setscrews and Allen headed screws with nuts, nylocs and washers. Metric fine nuts, bolts and socket cap screws are also in stock. In stock now are STAINLESS STEEL METRIC FINE M10 x 1.25 fine nylocs and M10 x 1.25 fine flange nuts. Also in STAINLESS STEEL METRIC M7 (7mm) Hexagon setscrews and bolts in various lengths. M7 (7mm) stainless steel socket capscrews, Allen head screws in a range of lengths together with stainless steel nylocs, nuts and flange nuts in M7 (7mm). STAINLESS STEEL METRIC M6 and M8 socket button heads with larger outside diameter than standard, as used on motorbike fairings. We have large quantities of BA (British Association), zinc plated nuts and screws. Stainless steel nuts, screws and washers are available plus a variety of brass BA is available. Please telephone or email your order. Payment can be by credit card over the telephone or cheque by post. We have a minimum postage and packing of £3.50 per order. Most other orders are processed at postage costs + £1.00. We are local to Newark and even if you are not we can post daily to everywhere in the UK and worldwide. Overseas postage and packing, please enquire and we will do similar. When ordering, please note that if we are at a show, your order will be given our full attention on our return. Zinc plate nuts and bolts or stainless steel nuts, bolts and screws from Newark to anywhere in UK or worldwide. WE NOW HAVE A NEW STOCK OF 2BA SLOTTED RAISED COUNTERSUNK MACHINE SCREWS. MOST SIZES UP TO 2" LONG. GENUINE 3/8" AND 7/16" HEAVY PATTERN WASHERS, NOT METRIC EQUIVALENT. THESE ARE A GOOD FIT AND NOT A SLOPPY METRIC FIT.